Another obsession I have from Europe are macarons. My only experience with macarons prior to going to Europe included those from Duchess Bake Shop, which did not impress me at the time. Once I had been to Europe and tasted the epitome of macarons from Pierre Herme (refer to my Paris Chocolate and Pastry tour post), I became been obsessed!!! Although maybe not as obsessed as I am with scones and clotted creme. I have had the pleasure of meeting Connie of Mirabelle Macrons twice now. 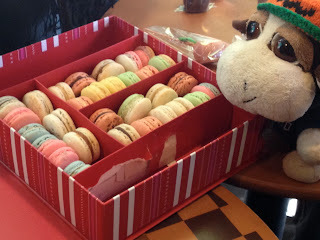 Her obsession with the macaron started when she was given some as a gift from a friend, who had brought them back from the Calgary Farmers Market. Once she discovered her first macaron, there was no turning back. Her obsession with the macaron has turned into a 2 year long journey culminating in her own business, Mirabelle Macarons. Although she is still working on getting her fledgling business off the ground, she has done some events, but is now working towards a method of distributing this mootastic product to the masses. On both occasions, she brought a beautiful assortment of these delicate, diva cookies to try. She has been working on exciting new flavors and has found a group of willing taste tasters to give their opinions, including yours truly, a traveled and educated bovine. Now lest you criticize my expertise, I admit that I only know what I like and what I don't like when it comes to macarons. My knowledge about macarons, including what makes a good versus a bad macaron comes from those I met in in Paris last fall who work day in and day out in patisseries. I was also told by every tour guide and foodie I came across in Europe that in their opinion, Pierre Herme was the epitome of macarons. They also believed that although popular, Laduree was recommended to tourists who didn't know any better. On first bite, the texture was perfect and brought me back to memories of Europe. The crispy exterior gave way to a soft and light interior that had just a slight bit of chew, but quickly gave way and melted in your mouth. My favorite flavor included chocolate hazelnut, which had a very faint hazelnut taste and chocolate that was not overwhelming. In second place was passion fruit and chocolate, one of Pierre Herme's signature flavors that he calls mogador. I was pleasantly surprised that I preferred Connie's version with a distinct chocolate taste followed quickly by a tart passion fruit that lightened the feel of the macaron. In contrast, Pierre Herme's mogador flavor is a bit more muddled and is difficult to find the distinction between chocolate and passion fruit in his macaron. In third place was lemon, although it has a strong flavor was refreshing and not at all tart. This bovine will dare to say Connie's macarons are on the same level as those from Pierre Herme, the King of macarons, therefore making her the Queen! If you haven't tried a macaron yet, it is a life changing experience. Mirabelle Macarons can currently be ordered directly by contacting Connie and soon via online ordering on her website. One can only hope these delectable morsels will soon find their way into a farmers market, store front, or somewhere they can be made readily available for others to try. For those who have tasted these delights, Connie will be teaching macaron making classes offered through @ACanadianFoodie's Taste Tripping in early 2012. 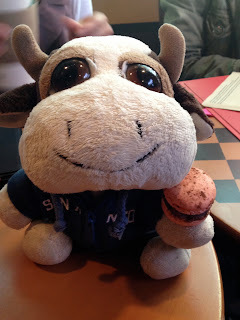 I haven't been to Europe and my only exposure to macarons is in European themed cafes. I thought Duchess was kinda good, but I'm glad to see that you've got higher standards and Mirabelle meets them! Can't wait to try 'em ... passion fruit and chocolate sounds great! I never appreciated Macarons (ie: from Duchess) until I tried Mirabelle Macarons....they're truly amazing and I totally agree with this review. After coming back from France this past summer, these are up to par even to the best of the best! You nailed it! I wish I had one right now.